What is Masonry? Masonry is a beautiful system of morality veiled in allegory and illustrated by symbols. If Masonry is a beautiful system of morality veiled in allegory and illustrated by symbols, are you truly a Mason if you have never looked deeper at the allegory and symbols of the Craft? What are we to do to gain further light? What is the light we are seeking? If I ask this of most of my brethren, they will say that it is the light of knowledge, the gnosis, Fiat Lux. If the statement above is true, none of these answers is correct. The light we are seeking is Morality. Not just any Morality, but the Peculiar (distinctive) Morality of Freemasonry. This Morality is spelled out in some ways in the words of the Ritual; it includes Brotherly Love, Morality, Relief, Truth, Temperance Fortitude Prudence and Justice. But the true emanations of the light we seek are veiled, we see through a glass darkly. We must peel pack the layers, we must study and interpret the symbols of Masonry to attain the true light. I will caution you, this is a lifetime pursuit. As we grow, the symbols will reveal new insights; our ideas of their meanings will change as we see more clearly and as we grow as men and Masons. Not only the symbols, but the Ritual itself will provide great light if we will but listen to the words and think upon their meaning. Why do we approach the East upright? Why do service to Almighty God and a distressed worthy Brother occupy the same 8 hours on the 24-inch Gauge? At what degree are the Compasses properly extended? A study of these and all other areas of our Ritual will illuminate our ignorance and bring us closer to the light. I often say that our Ritual is written for purpose; not a word is wasted or out of place. It is our job to listen and use active thinking to ponder the ideals set forth in our various lectures to tear the veil to the truths behind the allegory. 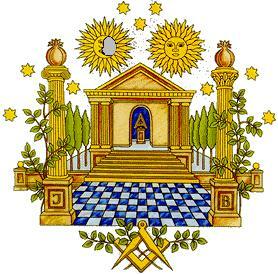 What is masonry? What should it be? Are you a Mason in your heart, or only a member of the Lodge?